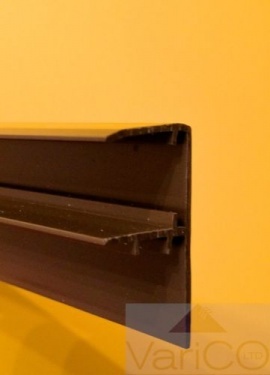 PVC F-Section is the ideal way to finish off the edges of your roof when installing polycarbonate sheets. Used in combination with our snap down rafter supported glazing bars or on its own it it will provide a water tight, draught proof seal to the edges of your roof. When used with the snap down rafter supported glazing bars it neatly snaps into the glazing bar base providing the perfect weather proof seal and finish. Available in 3m and 4m lengths in white and brown finishes.